Artificial neural networks are used to model systems that receive inputs and produce outputs. The relationships between the inputs and outputs and the representation parameters are critical issues in the design of related engineering systems, and sensitivity analysis concerns methods for analyzing these relationships. Perturbations of neural networks are caused by machine imprecision, and they can be simulated by embedding disturbances in the original inputs or connection weights, allowing us to study the characteristics of a function under small perturbations of its parameters. 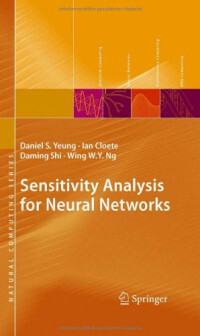 This is the first book to present a systematic description of sensitivity analysis methods for artificial neural networks. It covers sensitivity analysis of multilayer perceptron neural networks and radial basis function neural networks, two widely used models in the machine learning field. The authors examine the applications of such analysis in tasks such as feature selection, sample reduction, and network optimization. The book will be useful for engineers applying neural network sensitivity analysis to solve practical problems, and for researchers interested in foundational problems in neural networks.